We love to make and play on Water Blobs! 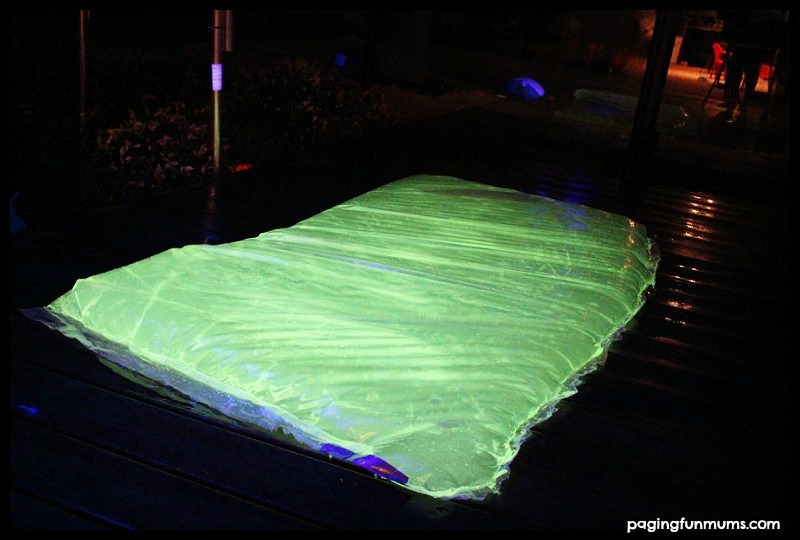 So why not make one that glows? 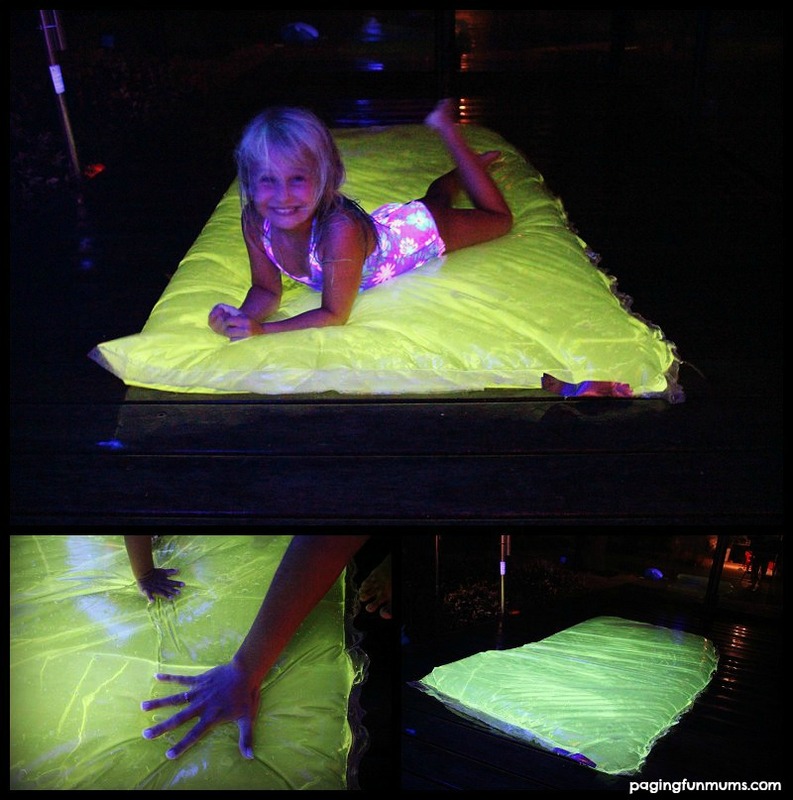 We bought a blacklight a while ago in the hopes of testing out some cool glowing activities – especially over our warm summer nights. 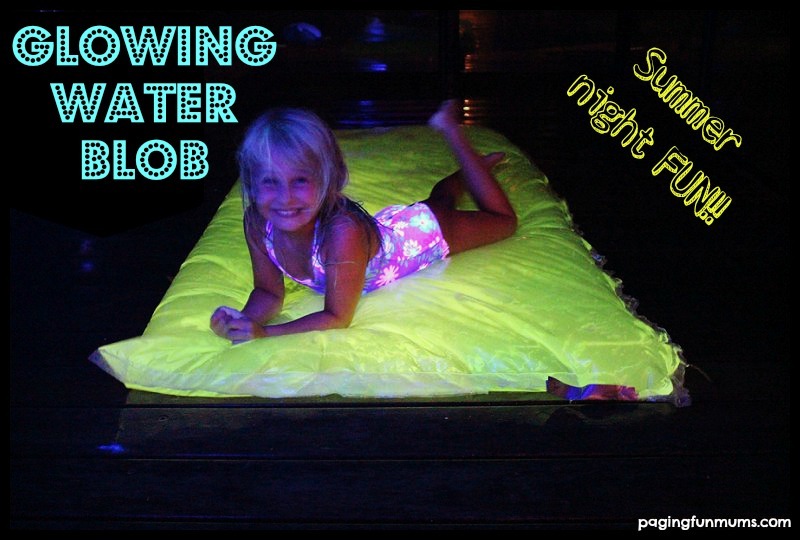 We found an awesome post on Glowing Bath Water from Fun at Home with Kids and this cool idea sprang to mind. 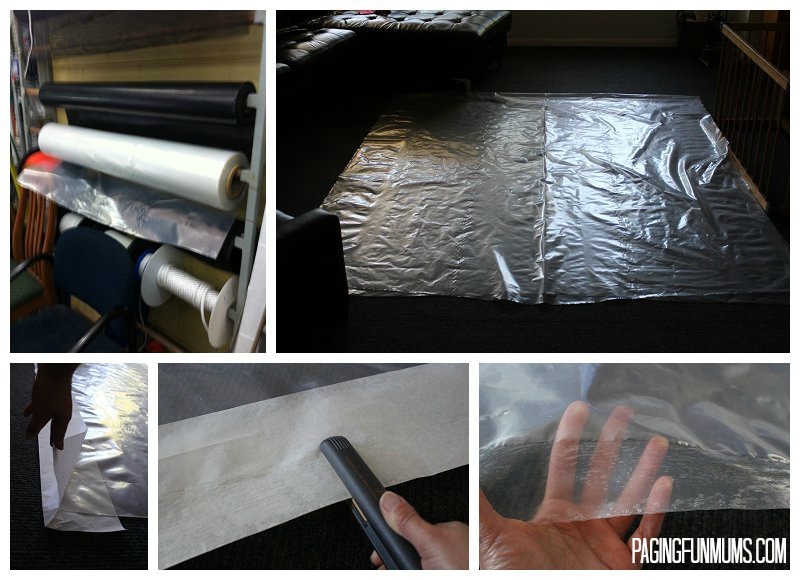 *We bought our plastic sheeting from the local hardware store off the roll. It was 2 meters wide and cost $1.80 per meter (I used 2 meters = $3.60). It is typically used by builders, painters and furniture removalists to protect furniture or flooring. Firstly I folded my plastic in half to give me a 2 x 1 meter rectangle. I then folded a strip of baking paper in half lengthways (aprox 80cm in length). I placed the folded paper over the join at the fold of plastic. Then we need to add the special ingredient to make the water glow. 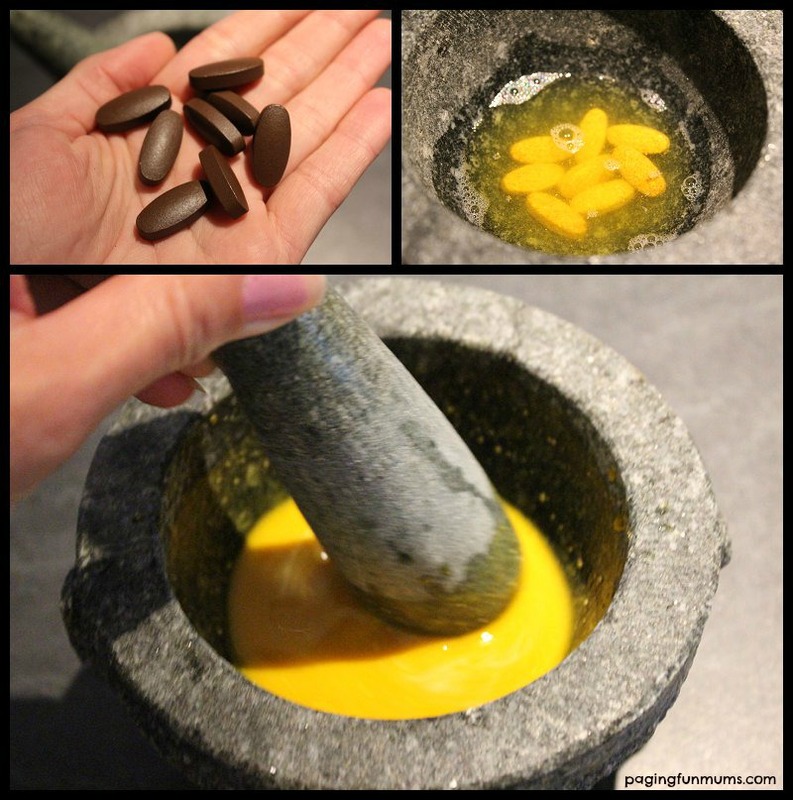 We used 8 ‘Glowing Tablets‘ that I rubbed under warm running water to remove the brown coating – we then crushed them up with 100ml of warm water using a mortar and pestle. 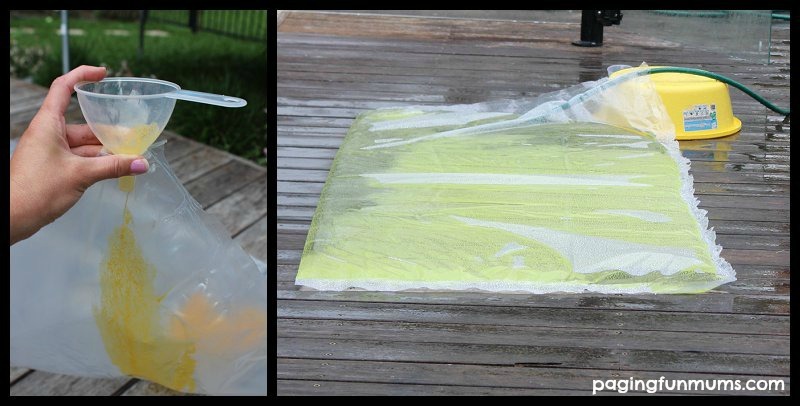 We used a funnel to easily add the ‘glowing’ liquid before filling the blob with fresh water from the hose…when the blob is full simply seal the opening using some more duct tape. Than we waited for the sun to set and counted down from 10 before switching on our blacklight – we were pleasantly surprised by a glowing blob and lots of squeals of delight from all the children. We hope you enjoyed the look of this activity and might consider purchasing your own Blacklight – maybe you could share one with a friend or neighbour like Jenni and I do? PS. my husband was excited to use our new ‘portable’ fluro fixture for camping and working on his car ;). IT IS SO COOL!!!!!! It turned out amazingly!!! What a fabulous idea. Thank you so much for linking – and I’m super excited to make one this summer! So did my comment about using duct tape show? I used it for a blob last summer with success. Tried this iron method yesterday and made 6 mini blobs. They all had mini leaks on seams. Any idea what I did wrong? Aesome ideas…please keep me posted w latest creations. Where is your black light situated? We replaced the bulb in our outside lighting.